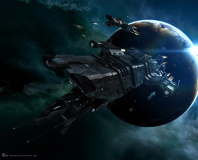 A distributed denial of service (DDoS) attack has been levelled against popular sci-fi massively multiplayer on-line role-playing game (MMORPG) EVE Online, taking the game's main servers down for more than fifteen hours. Problems with the Tranquility server cluster, which houses the main game instances of both EVE Online and its console-centric spin-off Dust 514, were first spotted early on Sunday morning when game creator CCP took the cluster down to investigate what it initially thought were simply network issues. The server cluster was restarted an hour later, but problems continued - and a further investigation resulted in the company taking the entire cluster back offline - where it remains following more than 15 hours of solid downtime. 'At 02:05 GMT June 2nd, CCP became aware of a significant and sustained distributed denial-of-service attack against the Tranquility cluster and web servers,' the company explained in a statement posted to its official Facebook page. 'Our policy in such cases is to mobilize a taskforce of internal and external experts to evaluate the situation. At 03:07 GMT, that group concluded that our best course of action was to go completely offline while we put in place mitigation plans. At the time of writing, the service is still down. The game's official Twitter feed reported that 'engineers are close to resolving the issues on Tranquility' and promised that the servers would be sent live again as soon as possible, but the company has been silent for the last three hours. Who is responsible for the DDoS attack and why is not yet know. It's possible that the attack is an attempt to extort money from the company, although it has not announced the receipt of any demands, or the result of a gamer venting his frustrations with the title. It's even possible the action is an attempt to profit from the game itself, delaying activities that could cost an in-game corporation dearly: CCP allows in-game profits to be translated to real-world cash and vice-versa, giving the game a serious competitive edge where fortunes can be made and lost. With CCP only a month into the running of Dust 514, a PlayStation 3 first-person shooter in which players can actively change the universe of the EVE Online PC MMORPG and vice-versa, the company will be eager to get the servers back up and running as soon as possible - and to find the person responsible, no doubt.